TOMATO DIP/CHUTNEY (tameta ni chutney) | Authentic Vegetarian Recipes | Traditional Indian Food | Step-by-Step Recipes | Give Me Some Spice! Whenever I make any kind of bhajias, samosas etc, I like to serve it with a combination of chutneys and dips. My recipe for green chutney is here. The tomato chutney/dip recipe is really quick and easy. It’s a lot milder chutney with a tangy taste which makes it a perfect dip to serve to young children too. I have been making this tomato chutney for a long time and every time – the ingredients may be slightly different depending on what is available at the time of making the chutney. The fun is in the experimenting. 1. Make a small cross at the bottom of your tomato and boil it in just enough water to cover it for a minute or two. 2. 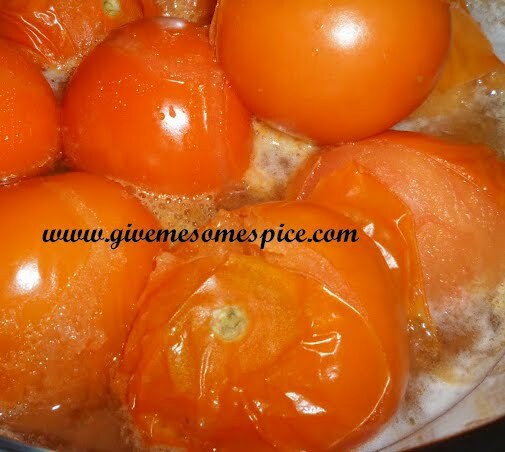 Once boiled, remove from the hot water and dip the tomatoes in cold water. This helps to remove the tomato skin quicker. 3. Chop the tomato into really small pieces. 4. Add the rest of your ingredients to the tomatoes and allow this to cook until the tomatoes have really softened. 5. Blend this mixture with a potato masher or electric blender. 6. If the chutney/dip feels too runny, allow it to simmer a bit longer.7. 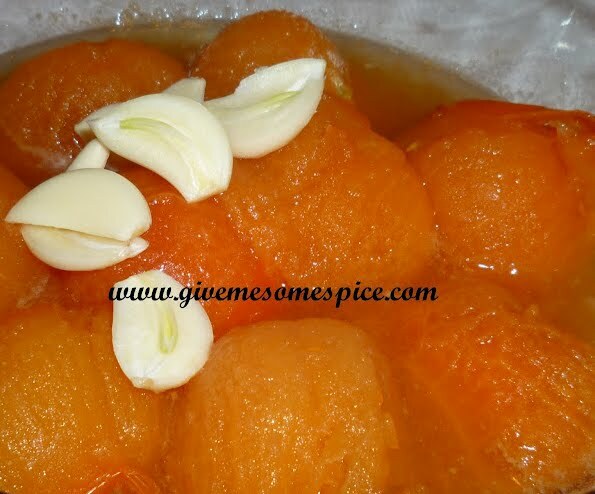 Taste and add salt or lemon to get the tangy taste. 9. Sprinkle some basil before serving your tomato chutney. 10. Any left over chutney/dip should be fine for 2-3 days if kept in the fridge.